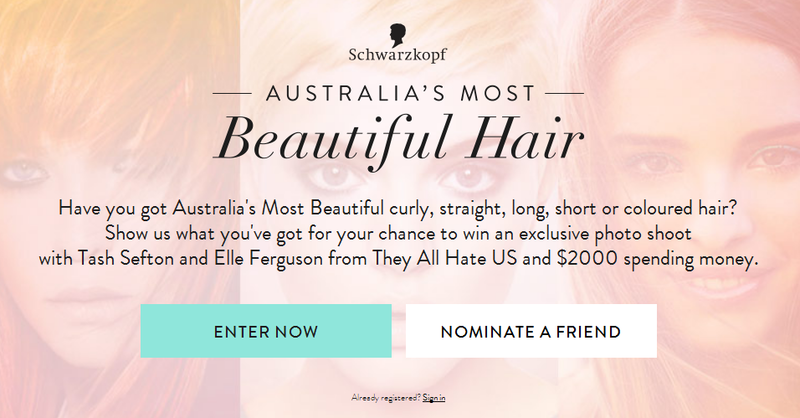 Have you got Australia’s Most Beautiful curly, straight, long, short or coloured hair? Show us what you’ve got for your chance to win an exclusive photo shoot with Tash Sefton and Elle Ferguson from They All Hate US and $2000 spending money. Rockin’ some beautiful hair? Entering Australia’s Most Beautiful is easy as 1, 2, 3. Do you have Australia’s Most Beautiful curly, straight, long, short or coloured hair? Select your hair type, fill in the super easy form and upload a photo of your beautiful hair. We will award five category winners based on votes. So to improve your chances, don’t forget to share your entry with your friends! Category Winners will each receive: Please confirm prize pool. Each Category prize is valued at a minimum of $599. fashion blog ‘They all Hate Us’. • Feature on ‘They All Hate Us’ social media. • Two economy return flights to Sydney from the winners nearest capital city (up to the value of $1,500 depending on point of departure). Hotel including breakfasts (up to the value of $1,000). • Dinner (at the restaurant in the hotel to the value of $400). • $2,000 spending money for your weekend of style. The Major prize is valued at a minimum of $4,900.